So, you wan't to learn how to do a burnout. You've come to the right place. 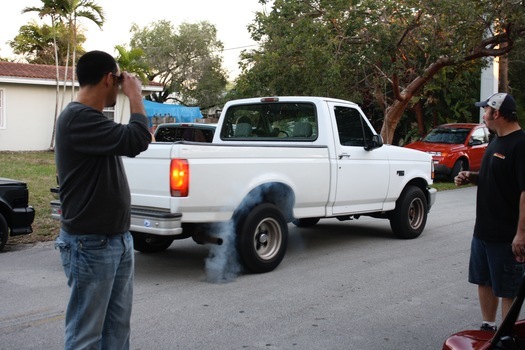 This beginner's guide to burnouts will teach you the tricks of what so you you can have fun destroying tires and annoying your neighbors. See that guy up there? That's Glenn. Glenn loves doing burnouts. Glenn's does burnouts on motorcycles. Glen does burnouts in cars. Glenn has done a burnout in just about everything with an engine and tires. ATVs? Yep. Golf carts? Yep. You could say he's a bit of an aficionado. Why Would Anyone Do a Burnout? 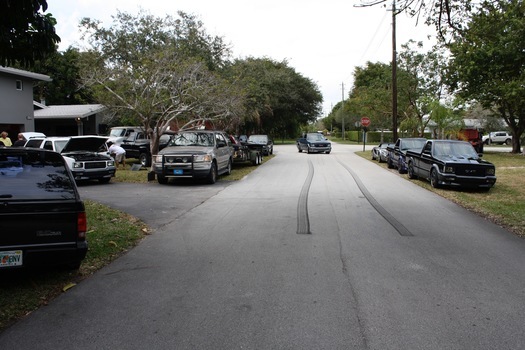 Well, as you probably could guess, burnouts are kind of fun. They're useful for showing off, causing a scene, or just entertaining yourself. In drag racing, it's common to "dust off" the tires to remove rocks and debris to get the best grip possible. Competition tires are made from rubber compounds that perform better when warm. As a result you'll see drag racers with slicks doing a significant burnout to make sure the tires warm up. You'll occasionally see drag racers go far past the lights in order to clean off the start of the track and lay down a good fresh layer of rubber on the road for additional grip. That the stunts and tricks described in this article should be performed by professionals in controlled environments. Do not attempt to duplicate, re-create, or perform the same or similar stunts and tricks at home, as personal injury or property damage may result. The producer of this article is not responsible for any such injury or damage. The man hates burnouts. They are considered a nuisance by most people, including the law. Unless done under controlled conditions at a competition area, it'd be safe to assume the neighbors, fellow drivers, and police will all not be real excited. It doesn't really matter if it's a private or public parking lot, be prepared to receive a ticket if the law disapproves of your fun. Burnouts are usually not dangerous, but their not exactly safe either. 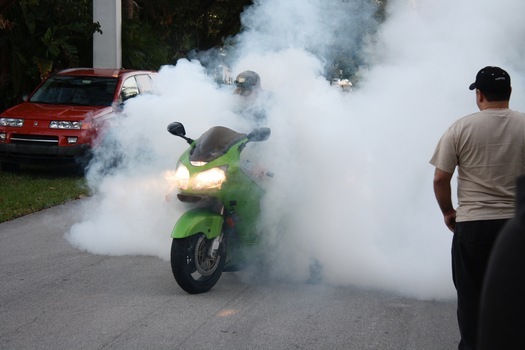 Theres a number of safety concerns with burnouts. If you're going to do doughnuts or rolling burnouts, make sure your buckled in and the doors are shut. It's not particularly cool to fall out of the car as it spins wildly. Stuff shoots out the back of the car. Rocks, debris, and parts of the tire are all going to be flying around. The wheels will be moving at high speed even if the car is sitting still. It's wise to make sure nothing is in front of the car in case it starts to grip or lurch forward. Also, in the case of extreme mechanical failures, parts of the driveline may attempt to leave the vehicle at high speed. With all the potential for flying particles, keep a good distance from any car doing a burnout. Rear wheel drive cars are generally the easiest to do burnouts in. Cars and trucks with rear wheel drive tend to have pretty strong drivetrains and are generally the most fun to do burnouts in. Front wheel drive cars tend to be economy vehicles with less horsepower and cheaper parts. Not to mention they the engine weight is over the drive wheels. This combination makes them less desirable burnout vehicles. All wheel drive cars need to be very powerful to do burnouts, and when they do it's pretty much impossible to do a standing burnout. Each drive type changes your technique. Manual transmissions let you break the tire's traction easily. Revving to a high rpm and popping the clutch will apply a lot of torque quickly, which is great for burnouts. Automatics are very different because you cannot pop the clutch. You'll need the right combination of weight, power, and grip to accomplish a burnout with an auto. Especially with any car that's not rear wheel drive. The differential used in your car will change the characteristics of your burnout. The differential determines how power split to the wheels of your car. An open differential is most common in cars. It will send all power to the first slipping wheel, often resulting in one-wheel burnouts. Long one-wheel burnouts can cause extra wear on the differential ring gears as the oil breaks down from high speeds and friction. However, if you manage to get a good, even start you can get both wheels to spin. Limited slip differentials use clutches to send power to the wheel that has traction. These typically create a desirable 2 wheel burnout, but use caution - those clutches can glaze over with heat. In either case, weight distribution and torque of the engine can cause uneven forces to be applied to the tires during a burnout. This can change how the wheels spin. High performance tires will make burnouts harder and more expensive. Older or harder compound tires will make it easier. 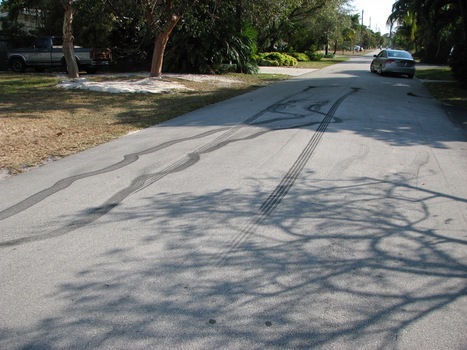 It's not uncommon to use something slick to help start a burnout. A burnout is really just overcoming the traction of the tire. It's just Power vs. Grip. 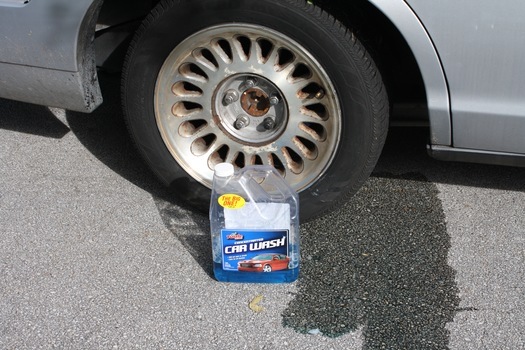 By adding, water, car wash or bleach you can reduce the initial grip to make burnouts easier to start. These liquids can also help create additional smoke. 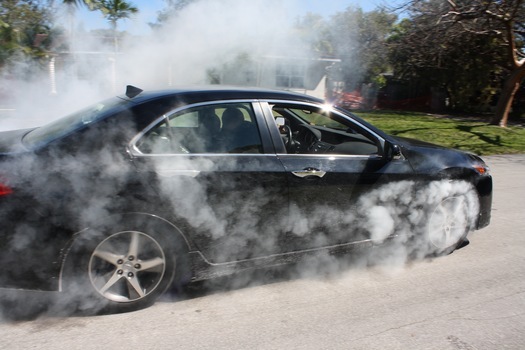 Burnouts are hell on any moving parts of your car. Obviously the tires will have a reduced life (if any is left at all?). The differential, driveshaft, transmission, clutch, and engine are operating in conditions they typically aren't designed for. Long burnouts run the engine at high rpm while not moving the air usually used to cool it. This can really put a lot of stress on the cooling system too. There's tons of videos of gear heads attempting a burn out only to find out the smoke is coming from their clutch instead of the the tires. Don't be that guy. Be prepared to break your car. Put the transmission in the lowest gear you have to keep it from shifting. Press the gas pedal down and build some tension in the front wheels. Release the brakes very shortly after and mash the gas pedal to apply a quick shock to the tires. Enjoy your burn out - Keep an eye on the gauges and your surroundings. Release the clutch all at once and give it lots of gas. You may have to slide your foot sideways off the pedal and let it pop out to get a quick engagement. Note: With manuals, if you smell something that isnt rubber, take a break to let your clutch cool off. Progressivly press the gas down. NOTE: All wheel drive burnouts are reserved for high powered cars who also don't mind breaking parts. Release the clutch quickly and mash the gas pedal.